Dalek Who? 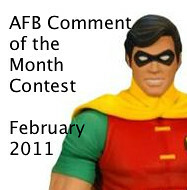 The AFB Comment of the Month Contest for February 2011! First off, thanks to everyone who commented on last month’s blog posts! Congratulations to jboypacman for being our randomly selected winner! Once we hear from jboy (you can contact me through the AFB Forum - send a message to "Andy"), his choice of either the DC Universe Classics Wave 16 Creeper figure from Mattel or the Marvel Select Deadpool figure will be on the way when available from Mike’s Comics N’ Stuff. 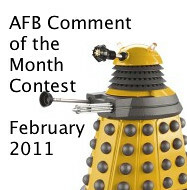 Now to February’s Contest: on offer are two great prizes, either the DC Universe Classics Wave 16 Robin (Classic) figure from Mattel or the Yellow Eternal Dalek figure from Character Options - the first Doctor Who offering in the AFB Comment Contest! Winning either would be a great prize. Well done indeed! 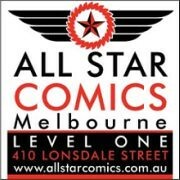 Come say 'hi' on the forum. Okay, I've got to admit, this is a pretty cool contest. AAAAAAAAAAAAHHH!!!!! HUGE ROBIN FAN!.... HNNNNNNG~ I REALLY want to win this. hell yeah.. the boy wonder!